Description: Thinly encrusting sheet or cushion, 3-5 cm in diameter, 1-3 mm in thickness. Surface partly translucent, with broad excurrent channels. 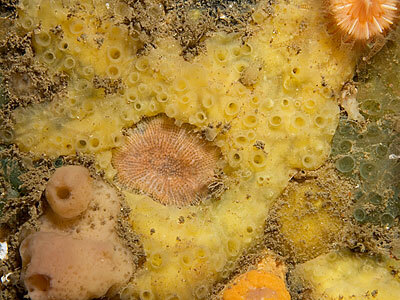 Surface is covered with pore-sieves (cribri) with raised rims, these close on disturbance. Oscules are fairly large, with raised rims. 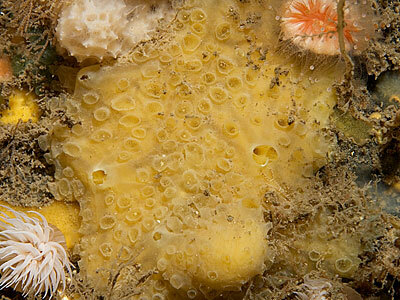 Habitat: Open coasts, on bedrock and boulders in strong tidal streams or Atlantic swell. Distribution: West coast of Ireland, outer English Channel, Northern Ireland. Similar Species: Reminiscent of a small patch of Hemimycale columella but yellow in colour. Picton, B.E. & Morrow, C.C. (2016). Ectyodoryx jenjonesae Picton & Goodwin, 2007. [In] Encyclopedia of Marine Life of Britain and Ireland.